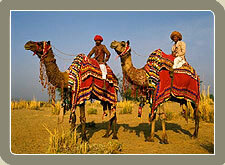 Dotted with many sand dunes and lying in the Desert State of Rajasthan, Bikaner was once a royal fortified city. 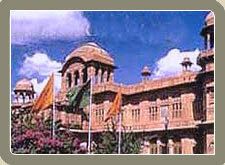 Bikaner is situated in the middle of the Thar Desert. This city was founded in 1488 AD by Rao Bika Ji. The city is located in North West part of Rajasthan. 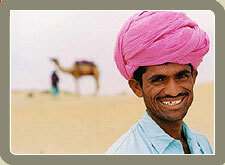 People from every part of the world; come to vi sit Bikaner for the scenic beauty of desert land. More popularly called the camel country; Bikaner is renowned for the best riding camels in the world and hence boasts of having one of the largest Camel Research and breeding farm in the world. The camel festival at Bikaner held in the month of January is also an event worth witnessing if one wants to get the actual color of the place. 'The ship of the desert' or camel is an inseparable part of life here. A camel besides doing transportation duties, also works on wells. Bikaner is also famous for its Old Havelis, the superb forts and palaces, created with delicacy in reddish-pink sandstone which bears testimony to its rich historical and architectural legacy. Apart from the rising and falling lanes, colourful bazaars with bright and cheerful folks make Bikaner an interesting experience to explore. Junagarh Fort : An impressive fort in the city of Bikaner was built in 1559 AD by Raja Rai Singhji. It is on of the few majors forts in Rajasthan. It is an unassailable fortress, which has never been conquered. The imposing fort has 986 long walls with 37 bastions and two entrances. The fort complex has many buildings such as; Suraj Pol, Karan Mahal (main entrance), Durga Niwas, Lal Niwas, Anup Mahal (famous for its gold leaf painting), Chandra Mahal (has exquisite paintings on the lime plaster walls), Phul Mahal (decorated with inset mirror work), Fort Museum, Durbar Hall, Gaj Mandir, Sheesh Mahal or mirror chamber etc. Lalgarh Palace : This grand palace is an architectural masterwork in red sandstone, and was built by Maharaja Ganga Singh Ji in the memory of his father Maharaja Lal Singh Ji in 1902. Sir Swinton Jacob designed this oriental fantasy. This architecture is a fusion of Rajput, Mughal and European architecture. The exterior contrasts dramatically with the oriental interiors and amenities. The palace has beautiful latticework and filigree work, which are hallmarks of a great craftsmanship. Jain Haveli : Havelis are ancient mansions of dwelling of the noble and wealthy. They are known for their opulent life style and intricate carvings and craftsmanship along with sprawling courtyards. Bikaner is full of such havelis and the notable amongst them belong to Kotharis, Rampurias, Vaids and Dagas. To view these havelis the suggested route is Gogagate, Daddhon Ka Chowk, Rangari Chowk, Assanion Ka Chowk, Mohta Chowk, Binnanion Ka Chowk Daga Chowk, BK School and Jassuar Gate. Bhandeswari Jain Temple : It is a fifteenth century temple and is the oldest monument of Bikaner. The temple is decorated with rich mirror work, frescoes and gold leaf paintings. Gajner Wildlife Sanctuary : The lake and forested hills of this reserve, 32 km from Bikaner on the Jaisalmer road, are inhabited by wildfowl, hares , wild boar, desert foxes and a number of deer and antelopes including black bucks and blue bulls. The lake at Gajner attracts water birds in thousands. Imperial sand house migrate here in winter. Gajner Wildlife Sanctuary, houses the former Hunting lodge of Bikaner and has a beautiful lake surrounded by a dense forest. Road : Bikaner is connected by road with the major cities of India. Some important distance are : Delhi 456km Jaipur 334km, Jaisalmer 333 kmMay devine grace of Lord Rama be with all your life. Wish you happiness and peace. Happy Rama Navami.